It is Friday which means time to think about this weeks Family Fun Day. Family Fun Days is the opportunity to create one simple yet family bonding experience each weekend such as movie night, attending a local event. having a pic-nic in the park or making a new recipe and enjoying it together as a family. Keeping it simple while having fun. The blackberry bushes are full and ready for picking. Discover where there are blackberry bushes in your area that you are allowed to pick. 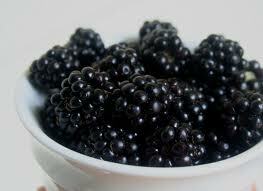 Take you family our blackberry picking and don't forget lots of containers to place your berries in. Click here to read A Thrifty Mrs. Blackberry picking tips. Once you arrive back home with your containers filled with fresh blackberries it's time to create something yummy to eat as a family. Pick Your Own has an entire collection of recipes including cobbler, puffs, ice cream and even a soup recipe. Click here to see the entire list and use one of their delicious recipes.